People love animated video stories about a product or service, and 90% of users say it has been helpful in making a buying decision. Facebook keeps growing and growing and the days of putting a static picture of your or service in a static Ad box online on a website are becoming less and less efficient. If you can craft and tell a compelling story around your product or service, you are far more likely to convert someone to buy your product or service over the competition. People love stories and when it comes to video advertising, Facebook prefers ads that have little text and those that tell your brand story in a fun and immersive way. As a high percentage of Facebook users browse with their mobile or tablet device, you need to distract their attention with something eye-catching and different with your video. When it comes to choosing your Facebook audience, picking one that is highly relevant to your Ad Campaign is crucial for success. People respond best when you are showing them an animated Facebook video that ‘speaks’ to them. The sharing of social media content has never been more essential. For example, someone may have seen your video advert and then goes on to share it with their friend network. When their friends see it, it sends a compelling message that that person who shared it is effectively ‘voting’ for the Facebook video, product or service. It is then highly likely that if your video is well-received that these friends of friends will, in turn, go on to share it as a high proportion of them could share a similar demographic, increasing the likelihood of further sharing. You can then use Facebook remarketing to keep your message and video in front of the people that have already shown an interest in it. Sounds complicated? It is easier than you think and we can help, plus the Facebook Blueprint gives a good overview. People are more likely to pay attention to content that is more relevant to their interests, and as a result, you will get better results if you customise your video ad message to that audience. Consider creating separate and unique explainer videos (or variations of the same video) for different demographic Facebook audiences. The key to Facebook advertising is that it is distractive advertising. People are on Facebook for ‘downtime’ and not mentally in heavy-decision making mode. Entertain them and grab their interest with a short and to-the-point video and try and keep it to 60 seconds or less. Tip: Remember that as Facebook videos play by default with the sound off your animated video should still grab attention even muted. By default, someone has to un-mute a video, and it is crucial that it has an impact and makes the viewer want to listen to it with the sound turned on and then watch the whole clip. Don’t forget it is essential to draw people into your Facebook video as early as possible because people make a decision quickly when it comes to ‘thumb stopping’ when scrolling through their newsfeed. A strong call-to-action telling the viewer what you want them to do after clicking, whether that is signing up or buying your product or service, joining your newsletter or sharing your video to their friends is essential. 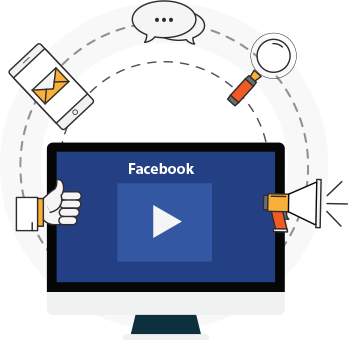 Running Facebook marketing campaigns can be an art in itself, and we understand the concept and importance of ‘thumb stopping’ explainer videos. Rest assured that once we finalise the production price, everything is included in your Facebook animation masterpiece and includes all music, research and script writing and character design time and feedback discussions. Be relaxed in the knowledge that there are never any hidden extras when working with us. Adjustments throughout the creative process are healthy, and you can be confident that changes are carried out quickly. We actively encourage customers to be involved in the feedback loop from start to finish. Companies sometimes run on very tight deadlines and we understand the pressure you might be under to launch your new online marketing campaign. Explainer videos can play an important part, especially when you might be sending website traffic and visitors to a customised landing page with your new landing page video embedded. We work very hard to achieve all of your deadlines, and if your project is urgent, we work to accommodate your deadlines wherever possible. We like to work in partnership with customers and help you through every step of the production. See as perhaps as an extension of your marketing team. We work hard to make customers delighted and happy with their finished animation. Most of our work comes from word-of-mouth recommendation.